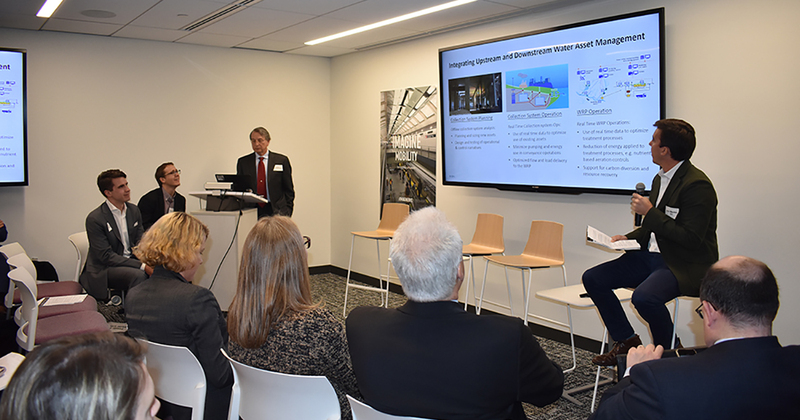 DHI celebrated World Water Day through participation in an expert panel discussion on integrated water asset management at NY Blue Tech's World Water Day Symposium - Meeting Water Challenges through P3s and Cross Disciplinary Collaboration held in New York on March 22, 2019. This annual event brought together a diverse group of water-sector stakeholders from New York, and internationally leading companies, to jointly discuss water challenges with integrated water management being the key common solution. DHI Technical Sales Associate, Josh Mendes, offered his expertise through a panel discussion on Detention, On-Site Reuse and Resource Recovery – Integrating Upstream and Downstream Water Asset Management. The technology focused panel discussed opportunities to mitigate risks and challenges related to storm and wastewater management in urban areas with combined sewer systems. They explored links between upstream onsite building level storm and wastewater detention, treatment and reuse, to downstream energy optimization and resource recovery at the wastewater treatment plant. The key focus was potential asset management synergies of this holistic approach in terms of energy savings and CSO reduction. Mr. Mendes specifically addressed the topic of real time data intelligence and the creation of Smart systems that provide an opportunity to optimize the use of intrinsic storage and capacity in the system. “By capitalizing on the spatial distribution of rainfall within a system, storage and routing can be optimized to maximize the use of the system. This type of conveyance system management can reduce the sizing of dedicated storage in the system, reduce pumping requirements, minimize the number of CSO events and volumes, and provide a more consistent flow and loading at the Water Reclamation Plant (WRP),” he explains. “With this approach, at the WRP, downstream process benefits can also be recognized. With more stable flows and more consistent nutrient loading to the plant, we can get closer to an idealized steady state delivery of waste-stream to the WRP. Ultimately, the amount of energy applied to the treatment processes can be reduced,” Mr. Mendes continues.